Planning the website structure gives the client the best possible launchpad for success. I am going to show you how I plan and design the structure of a new website in 8 steps to give the client’s website the best chance of organic search success. It is so tempting to dive straight into a front end design tool or start customising a website template. A friend of a friend launched an e-commerce website a few months ago so I had a quick look at the website they created. The website does not rank in Google for any keyword phrases at all. 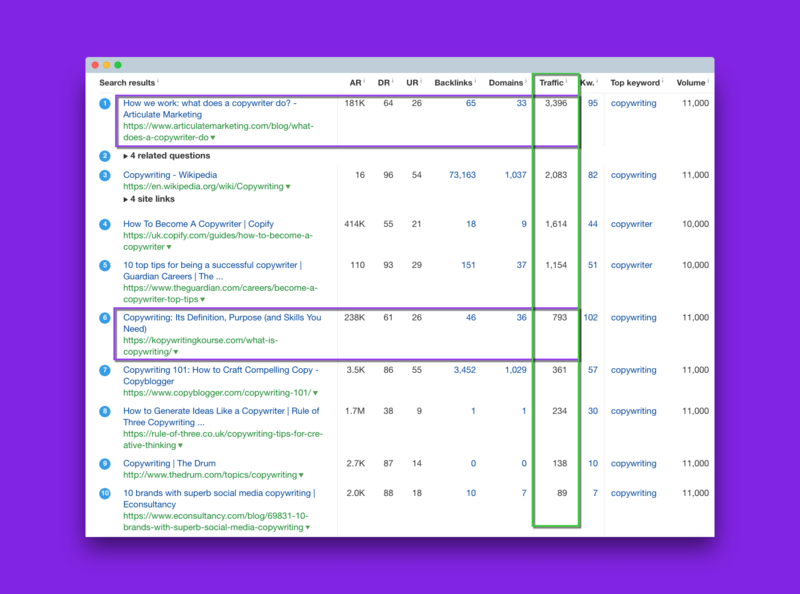 Then I did some keyword analysis for the website. 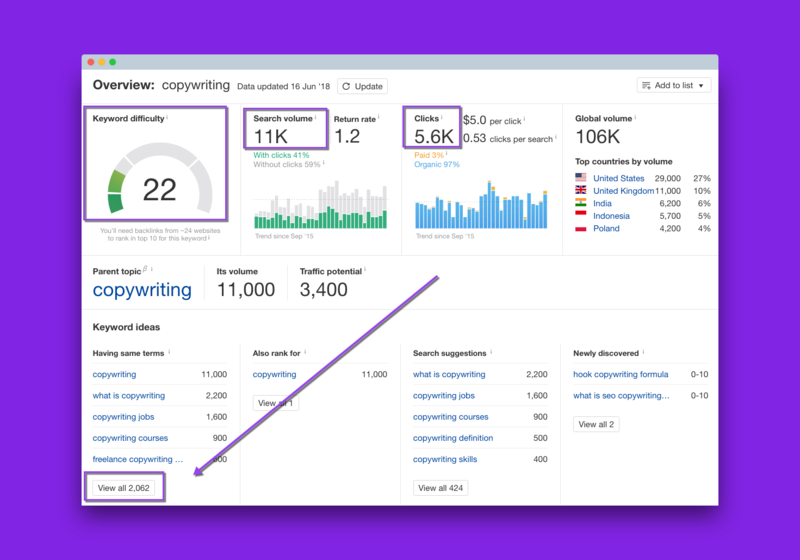 24,000 searches a month for one type of product; easy to rank topic. 5,300 searches for another product type; easy to rank. 2700 searches for another product type; no competition. She dived straight into photography and the Shopify content management system without planning the website around the most important aspect; potential customers already searching. You would not pay to rent retail space without an estimate of the passing traffic or previous store footfall. Planning a website is no different because location and access to people interested in your types of services is crucial to your success and avoiding a poor performing website. Planning a new website or re-designing and developing an existing site ? The planning process works for both new and existing website. As a web professional you can charge clients for discovery work to give them an outline of the search volume, traffic potential and recommended pages that should be incorporated. When you charge for planning you can identify if there is enough search volume and click potential to help reach the client’s online goals. Doing this work before creating a website proposal can also help you estimate how much to charge for a website. You can determine the market value of traffic and clicks and price your web design proposal according to market value as opposed to charging on a time and labour basis. Imagine charging £2000 for a website when you could have invested in planning and charged 3 times that amount. Alternately, secure the website project deposit and then start planning. Whatever your methodology, failing to plan and structure a website will do you and your client a major disservice. Website owners can be very impatient; who isn’t. 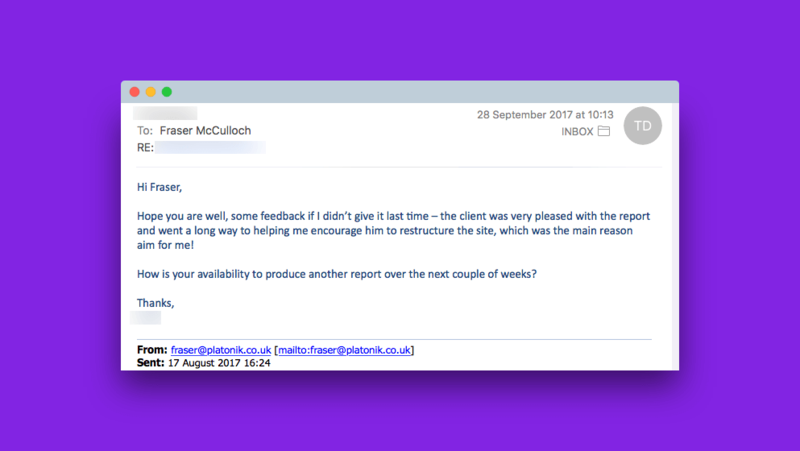 So if you can demonstrate results promptly after the website has been launched then you have the potential for ongoing work and even testimonials and referrals. Putting together a simple structure and sitemap is not enough. When I worked in an ecommerce agency over a decade ago, the account team would add a sitemap image as an afterthought to their web design proposals. A sitemap is useless without planning and research first. 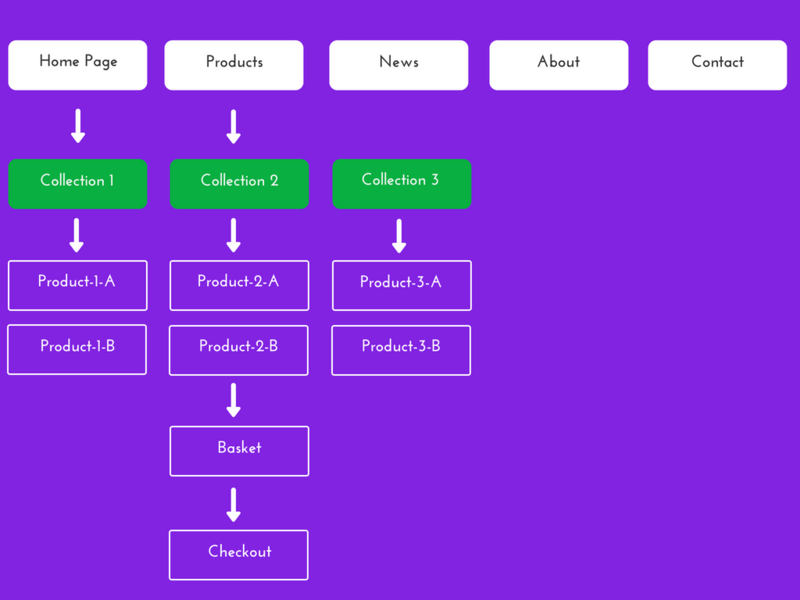 The structure of the website to build. 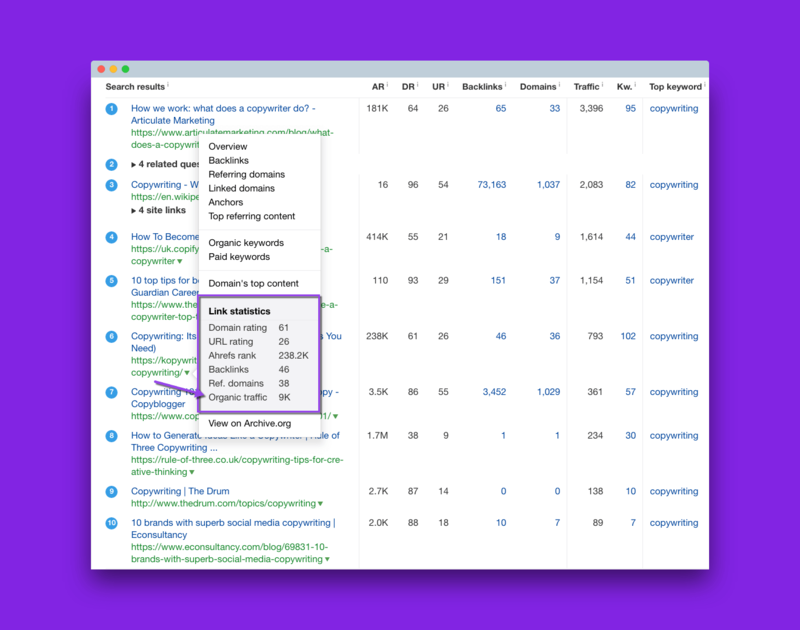 The meta tags including the title tags and meta descriptions to write. You will not need to chase the client to “please supply content”. You should not have unnecessary billing and payment delays because “we are waiting on the client to write and supply page content”. I am frequently commissioned by web designers and agencies to do keyword research for some of their website projects. I mapped out for an agency the structure, the pages and the content required for a brand new website for a manufacturing company in Canada. A web design agency in Manchester, England were looking to redesign an existing website and decided to include my work as part of their process. Architects and builders always put down strong foundations into a building or house; a website also needs strong foundations. Very rarely will a builder just start building a new house or extension. They hire an architect who provides them with a blueprint and the likely materials required. This blueprint also serves as a guide towards pricing the project. When I start a new website project, I like to identify the keyword search terms that are the easiest to rank for. 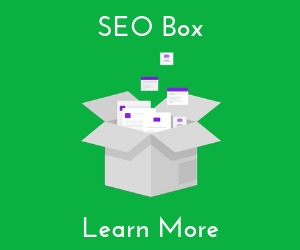 This will give the client the best opportunity to rank in Google and earn organic search traffic. It is not wise to use the most popular search terms when you are planning a new website. You will end up giving the client unrealistic expectations of organic traffic. 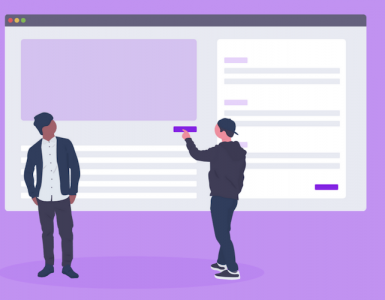 A new website with almost no domain authority will find it difficult to compete with established websites with lots of authority and backlinks. I will ask about the client’s business, the industry they are in, what they sell, what price they sell at. I ask who are their competitors and what the alternative solutions to their product that people use. First of all this gives me a grasp of their market in advance of the keyword research process. 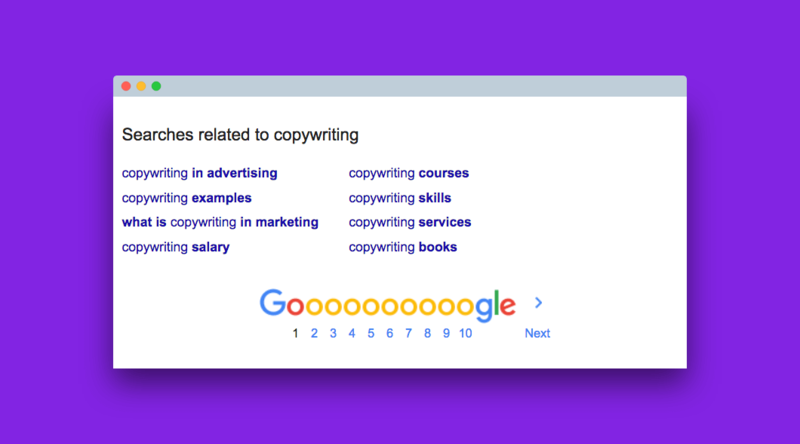 I tend to start my keyword research process with a simple Google search. I’ll Google the main term. Then I’ll look at the related searches at the bottom of the search results. Perhaps, I’ll use the Google Adwords Planner. 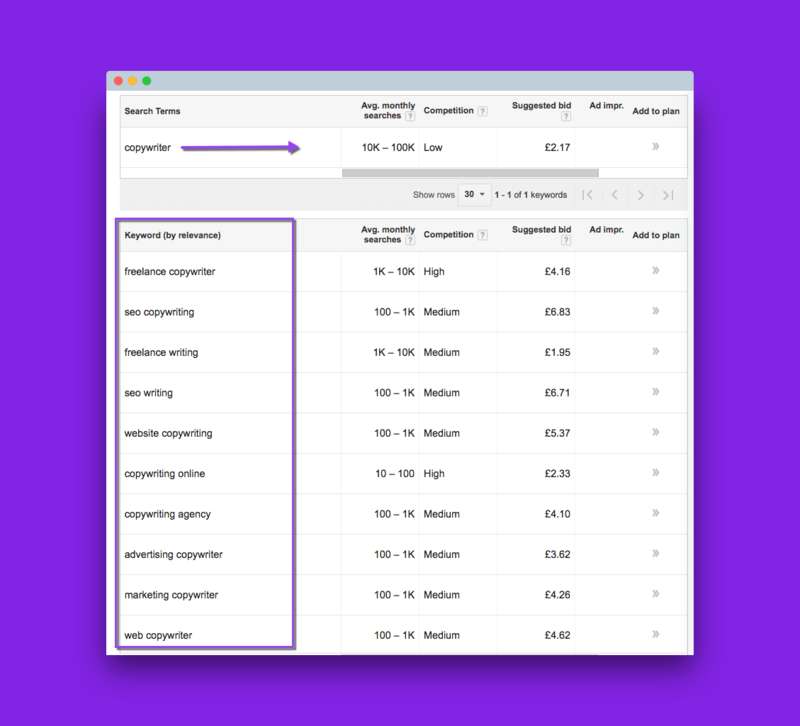 But I would avoid this tool as Google don’t provide organic search traffic and organic competition data; Adword Planner provides search “estimates” and advertising competition. 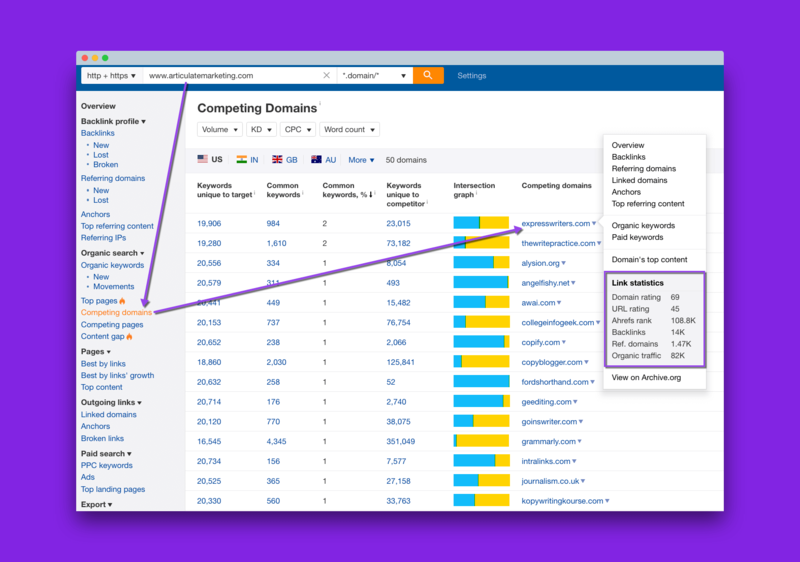 You need to use a paid keyword research tool; either Semrush or Ahrefs; the latter I recommend. I’ll look at the search volume for that query. 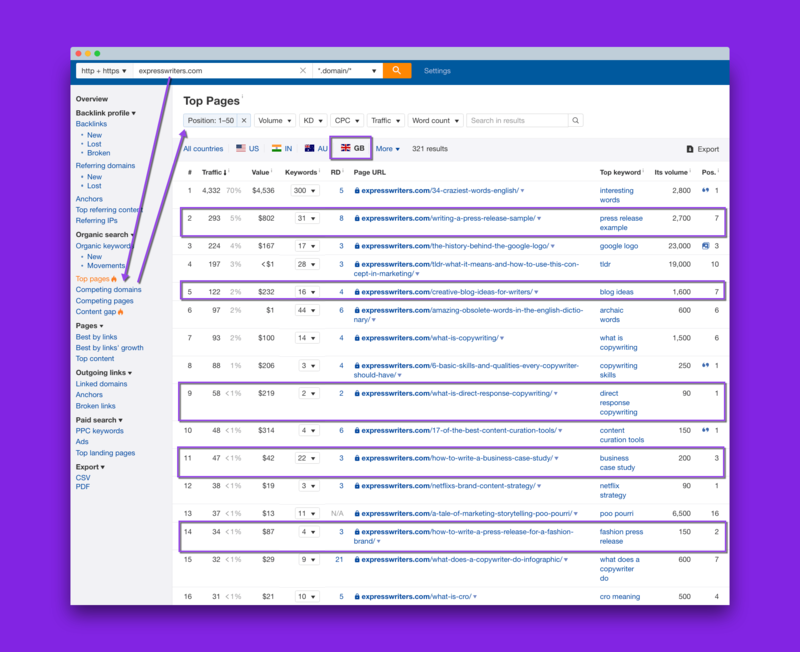 This is what you will typically see and find when you look for keywords with Ahrefs. There is good search volume for this query. But this keyword is too difficult for a new website. It’s a good topic – 2062 same as term queries. 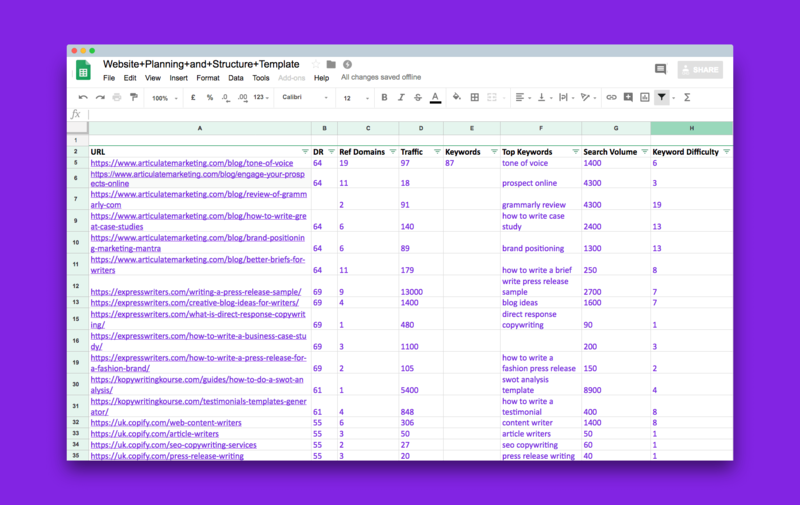 If you see a keyword and there are only 50 or so related keywords it’s probably not a good topic to plan content around; the topic is too small. Look at all the same as search queries. 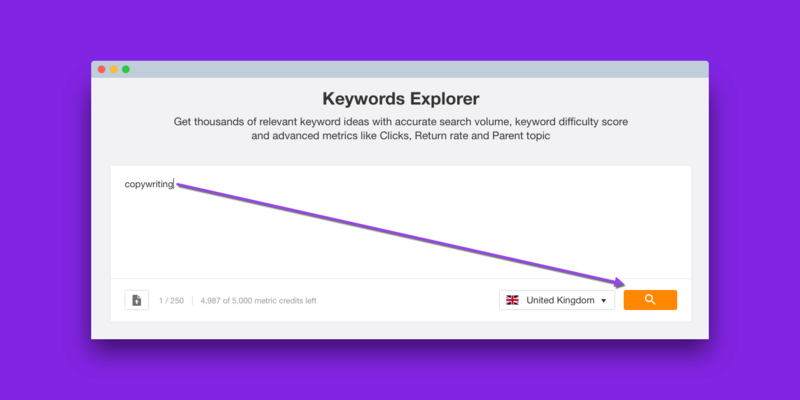 At a minimum, I look at the UK market for search queries with 1000 plus searches a month and keyword difficulty less than 20. For the US market, I’ll look for a larger search volume. There’s no hard rule to this; just some insights you pick up from experience. I filter these search queries down to a keyword difficulty of under 20. Now I like to use a text file or spreadsheet to start jotting down page topic ideas like this. 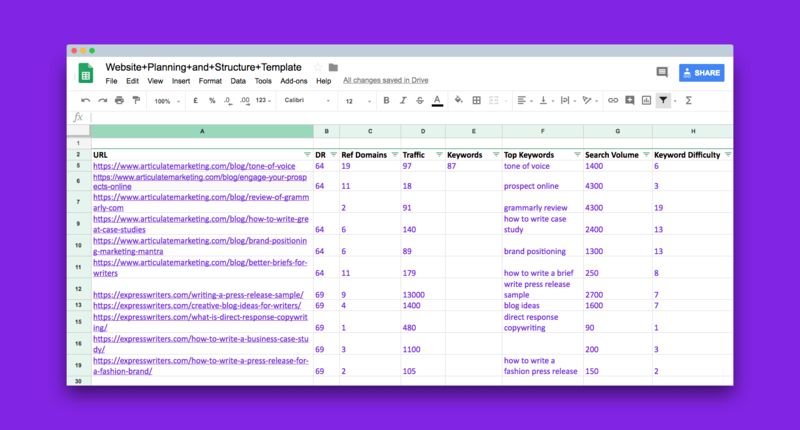 You can download the spreadsheet as part of this website planning guide. Specifically I’m looking at the traffic of the pages in the top 10 search results. If the traffic to all the pages is low, under 100, then this is perhaps not a topic with good search potential. If 3 or more of the top 10 pages in the search results have decent traffic to their pages, I will examine their websites. I will avoid non commercial looking pages eg: The Drum and Wikipedia. Frequently you will see non commercial websites in the top 10 that get a lot of organic traffic, a lot of their organic traffic is non commercial and entertainment related. So I avoid analysing these pages. I can hover over each page and see the website’s total traffic and other data like their domain rating. This result is a good website to inspect further. 7500 visits from organic traffic a month to one page ! This result is even better. I want to see what other pages these websites rank for and to find page topic ideas to help plan my site pages and content. Take the first part of the domain and paste it into the site explorer search box and hit return. Now I see a summary of the website’s key metrics. The organic search volume for this website is high so there should be plenty of page topic ideas I can find. Now hit Top Pages and select your country’s flag; for me the UK flag. organic traffic for the page. number keywords the page ranks for. search volume and their position. Consider user intention of competitors top service pages and posts. Now look at the above page URLs and consider if these pages and top keywords are what a potential customer would search and look for. what a copywriter does ? – this query has limited commercial intent and the user would be a long way off looking for copywriting services. write shorthand – not a query a customer looking to outsource copywriting would search for. surface pro 3 – absolutely nothing to do with copywriting services. Someone searching for “tone of voice examples” may be in the frame of mind of needing writing help. So this query definitely has some commercial intention and I shall add to my spreadsheet. After I have looked at the top pages reports for ideas then I look at organic keywords reports. Because I am planning a new website, I filter keywords by difficulty of 20 or less so than the easier to rank opportunities are displayed. My seo strategy for a new website is to identify easy to rank keyword and topic opportunities. 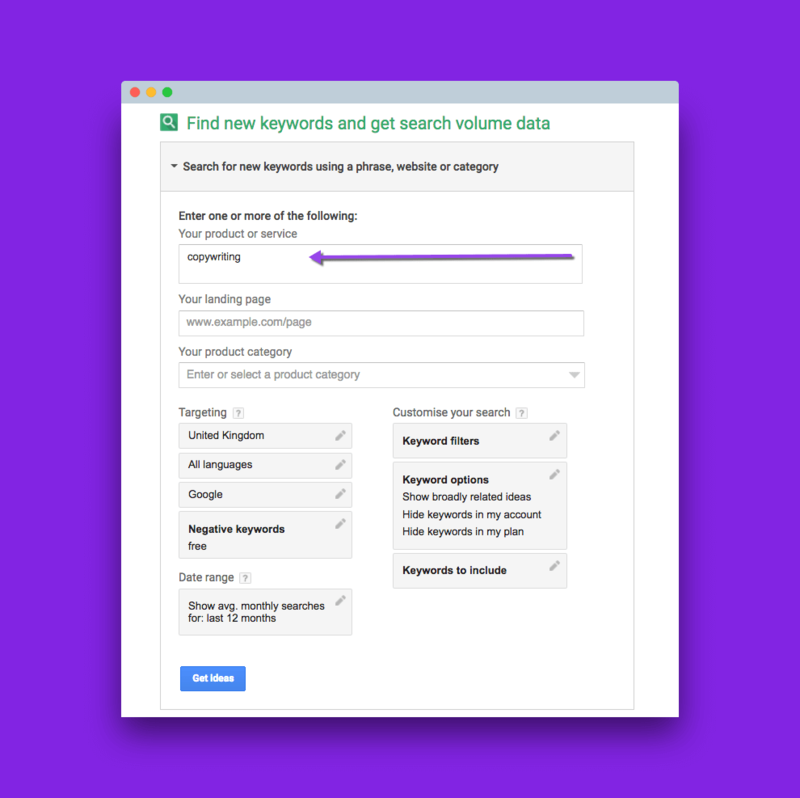 Identify keywords with high search volume. Ensure the top pages for those searches actually get clicks to their websites. 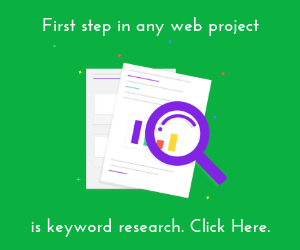 Find keywords with very low keyword difficulty. 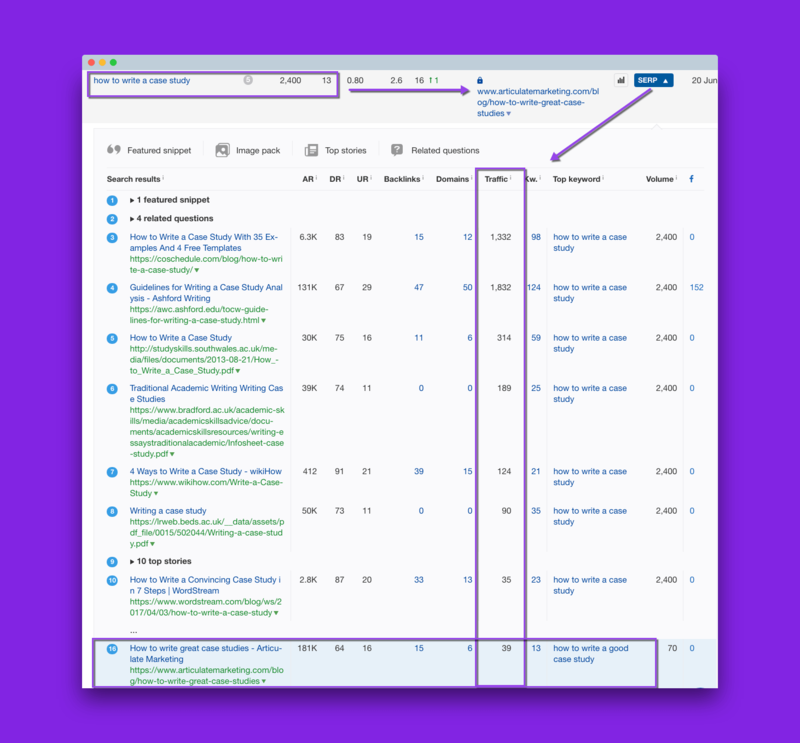 Find a topic with at least 100 same as, related keywords so the page can rank for multiple long tail keywords. 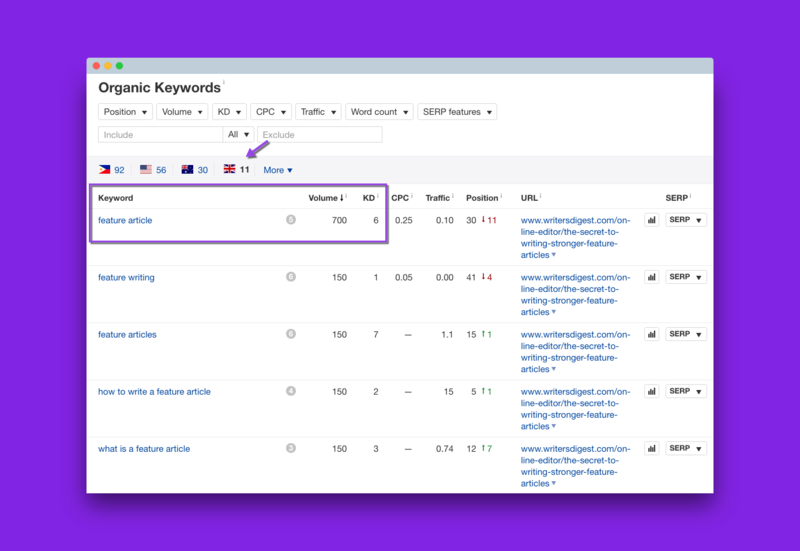 Let’s see what is interesting from the organic keywords report. When I get below 500 searches, I stop looking. Now I click on the serps tab of each of the highlighted results. This shows me how the page the keyword ranks for compares with the top 10 search results. First I look at the traffic of each page. Then I look and see what the other pages are about. Then I look at the serps of the other interesting search queries. 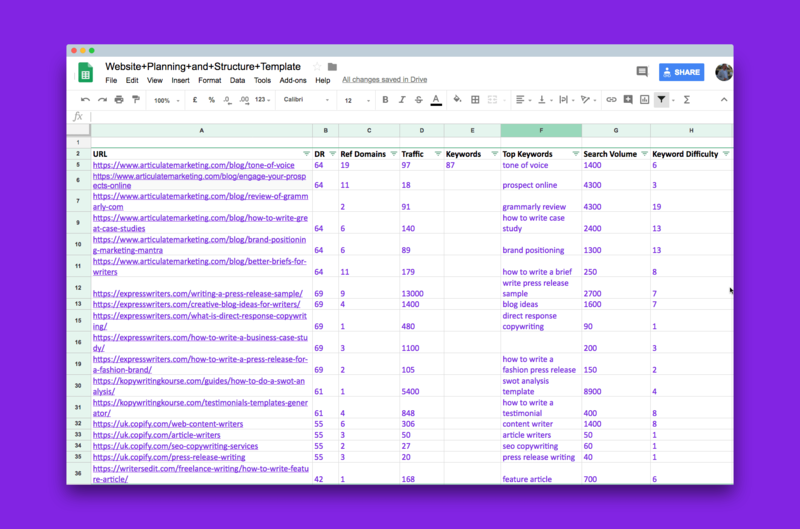 And I add all the pages and their metrics to my spreadsheet like this. I’m building a list of of potential topics that could be turned into blog posts or helpful resources for potential customers. Now I want to look at other related websites to see if I can borrow ideas for planning this new website. 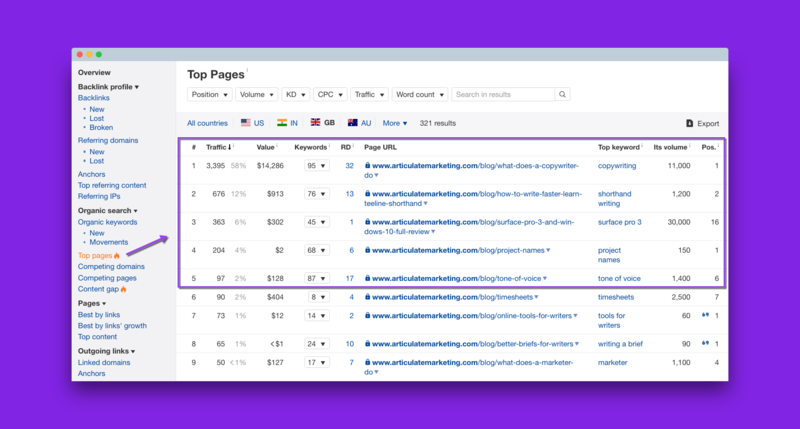 Find a competitor with a lot of organic traffic. If organic traffic is high, click overview. Now I repeat the same process of scanning the top pages and organic keywords. Scan the page url’s looking for page topic ideas. I also scan the volume column. They may rank poorly for a highly searched term. 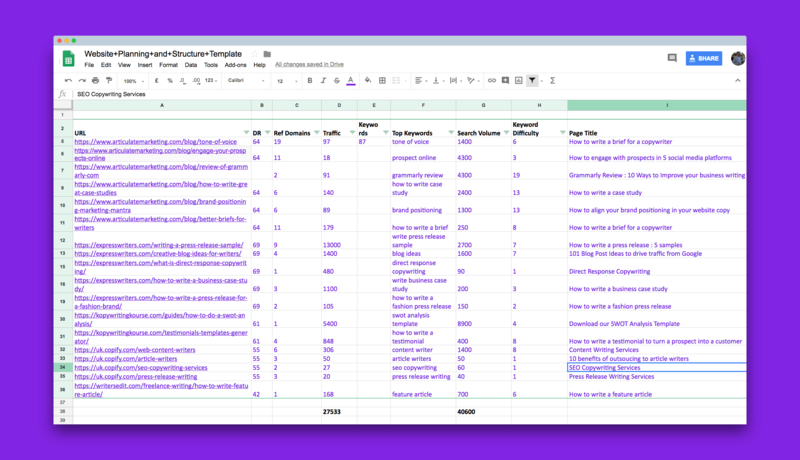 Now I pick out the topics that could be copywriting services or potential educational articles and add their metrics to my spreadsheet. Then I repeat the process above. 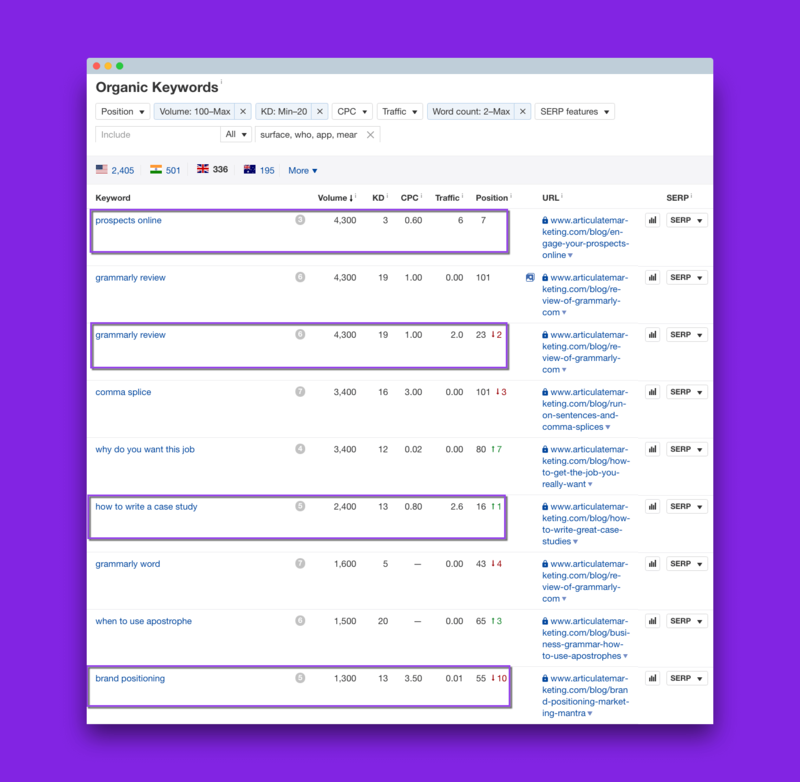 Look at top pages for keywords and topic ideas. 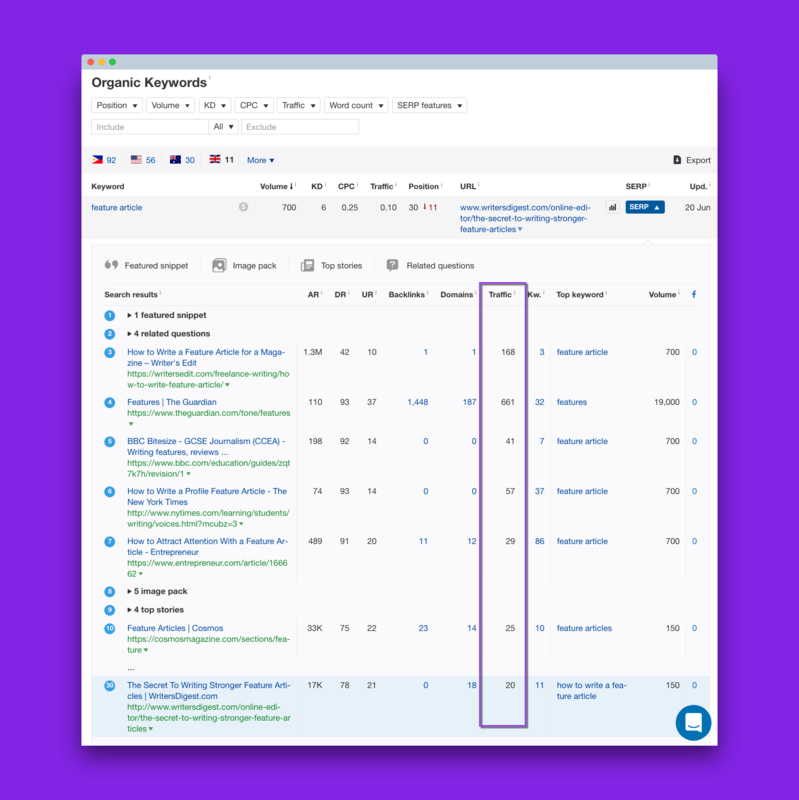 Look at organic keywords with high search volume and low difficulty. Add these pages and their metrics to my spreadsheet. 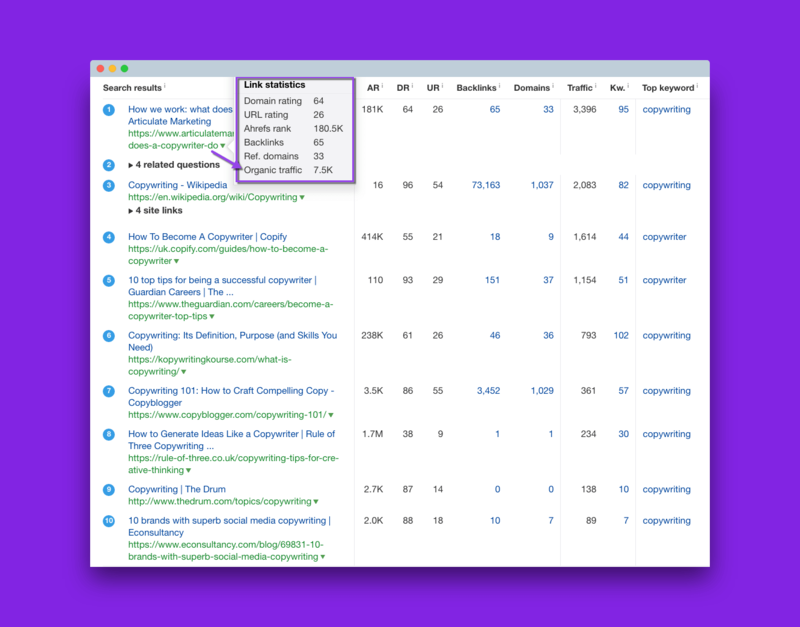 Now take some of your top keywords and pop them into the content explorer tool to see if there are popular page topics. Enter keyword in search box. Filter by Language – in my case English language. Referring domains – 0- 20. Select in title, in content or everywhere. 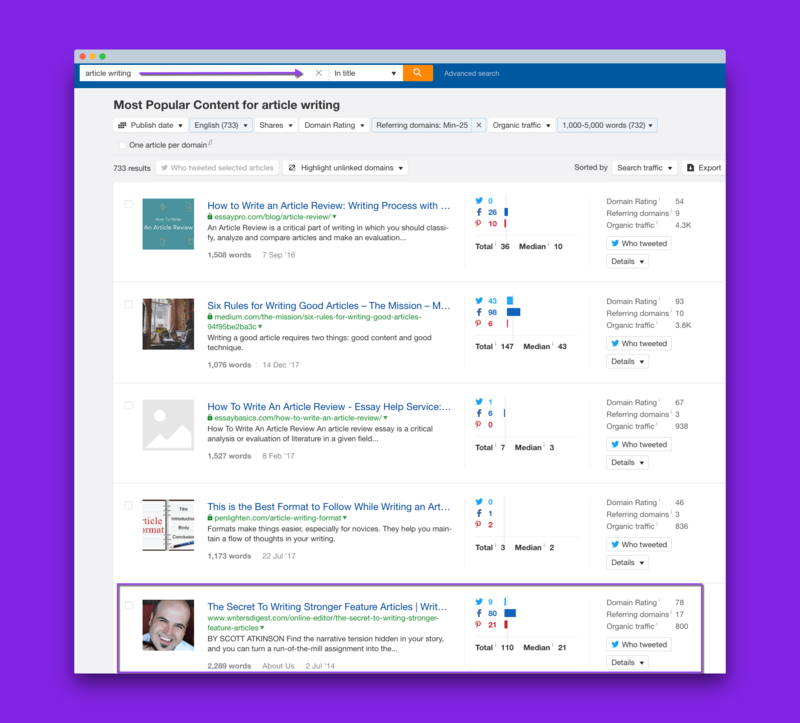 Sometimes you can find some great page topic ideas that rank well and get good traffic. 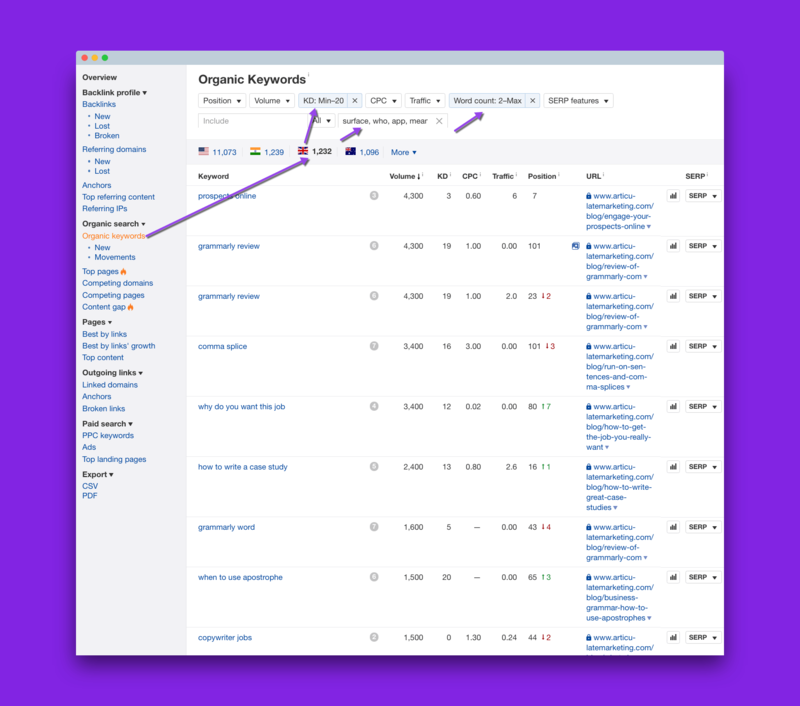 Then click the details link to see all the keywords this page ranks for. 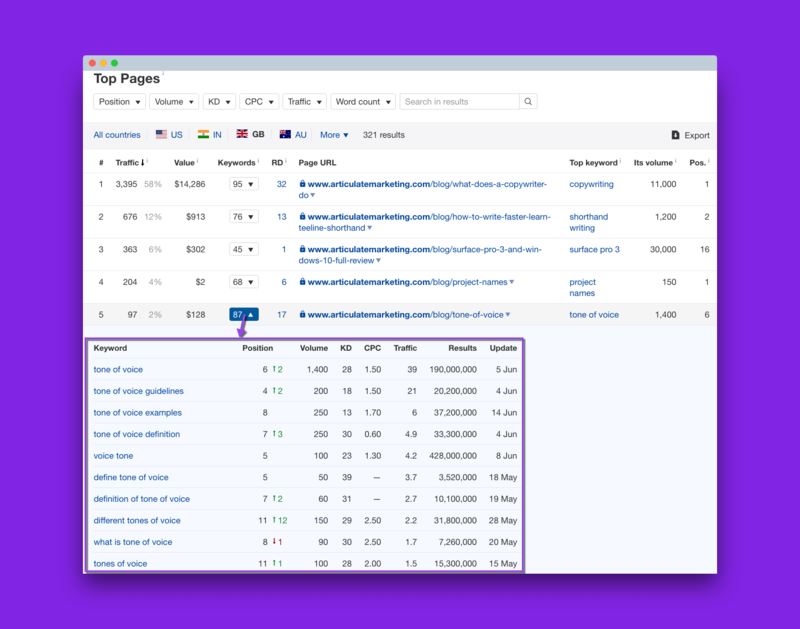 Then select View All Keywords so you can analyse the traffic in your country. 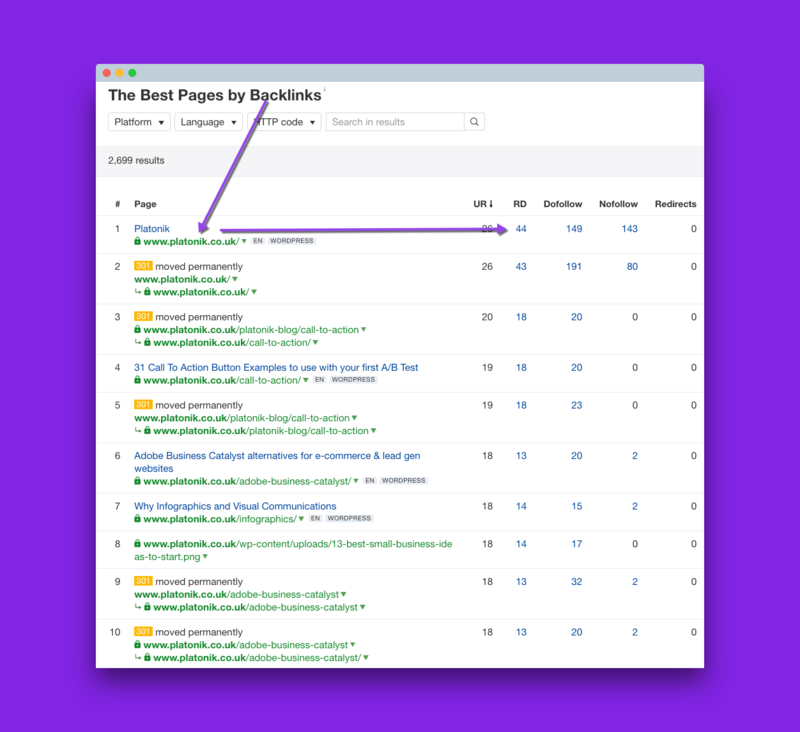 Now click the SERP tab and look at the metrics of the top 10 pages. Then add this topic to your spreadsheet. What is the user intent behind the search queries? Why would people search for this and why do people want feature articles ? This is where you need some knowledge of a client’s business or industry when planning and researching. I know this industry, not in depth but enough, and some researchers could have missed this keyword or topic. PR managers may search online looking to commission a feature article for their new CEO or an important member of staff. So intention behind the query may not just come from SEO knowledge but also business industry experience. So far I have found 20 topics that can be created for the new website. In total they have a monthly search volume of 40600 and a click potential of 27533. That’s enough research; now I start to map out the structure of the website. Now we can add in some page title ideas to bring the research to life. Since the website in this example will be an informational, lead generating type of website, the primary site structure will be fairly simple. You can click the outline of the site map, the dialogue box opens and you can enter your primary site pages. I would not worry too much at this stage as the primary pages are not going to rank for many keywords. In addition, your client may prefer to have ‘what we do’ called our ‘services’; or “services” called “copywriting services”. I’ve not added in the utility pages to this site map; it would mess up my design and confuse the prospective client. But just know you need to add these pages to the website you design and publish. With the exception of your terms and conditions or privacy page, I would no-index the other utility pages so you only give Google your best content. 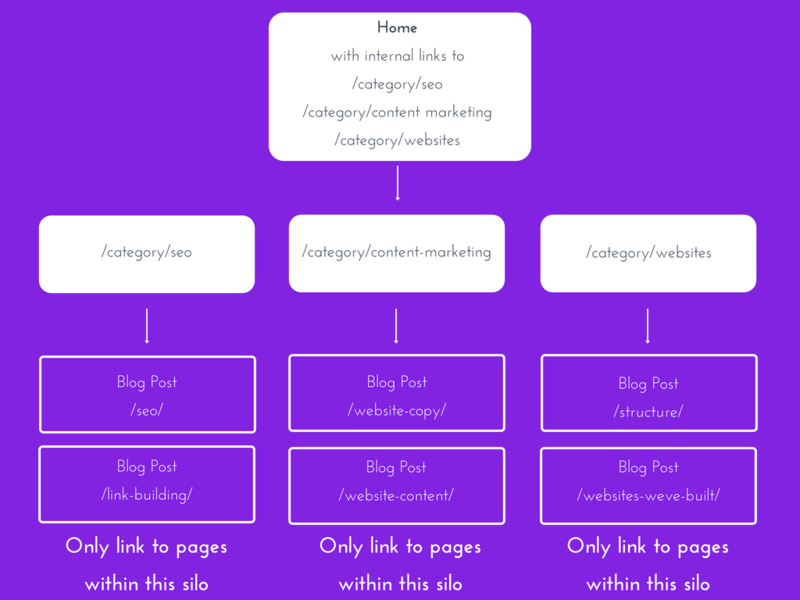 Here is a diagram of what the website structure should look like. Previously, I used Excel to create the site structure template. But since moving to Google Sheets this feature is not available. 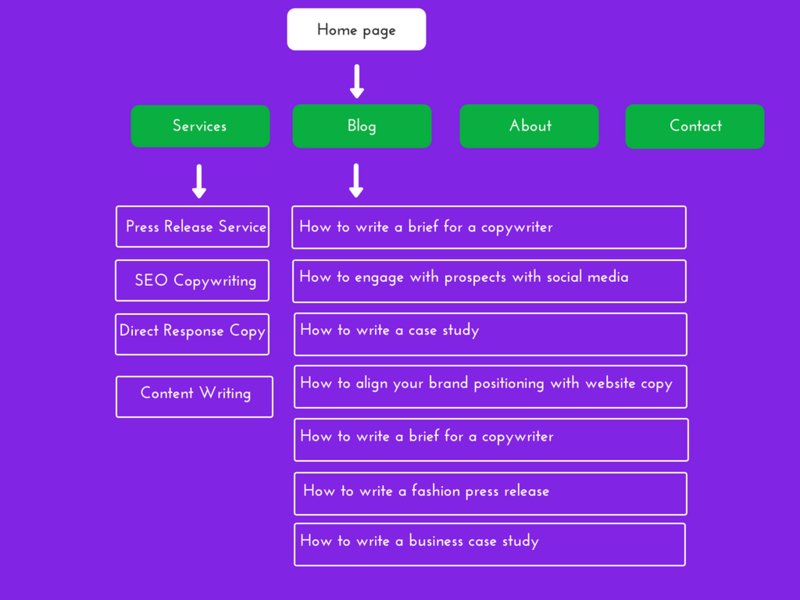 So I have decided to give you a diagram of a website structure using a Canva design template. Create your pages and post ideas, fill out your titles and then edit the Canva site map template. My home page gets the most links (hence it has the most authority). Most websites earn the majority of their backlinks to their home page. Therefore it should make sense to use that page authority and pass your link juice onto other important pages. Therefore on my home page I link to the next most important pages in the body of the page and in the navigation. This one site structure tactic will help improve your SEO rankings in Google. A silo is a vertical structure for storing things and is very easy to achieve when creating or re-developing a website. I have a silo on my site called “websites”. I created a category within WordPress like so. Then I assigned all posts relating to the topic “website” to this category. Then you create another silo. I have an SEO silo with all my seo posts that are contained within it. And of course I link from my home page to each silo to pass on link strength. Relevancy – if you walked into shoe section of a men’s shop you wouldn’t expect to see shampoo products, you’d expect to see either other shoes or perhaps socks. SEO – by linking similar pages with anchor text from similar content it will help ranking your pages better. User experience – users can read multiple posts to boost dwell time and reduce bounce rates. 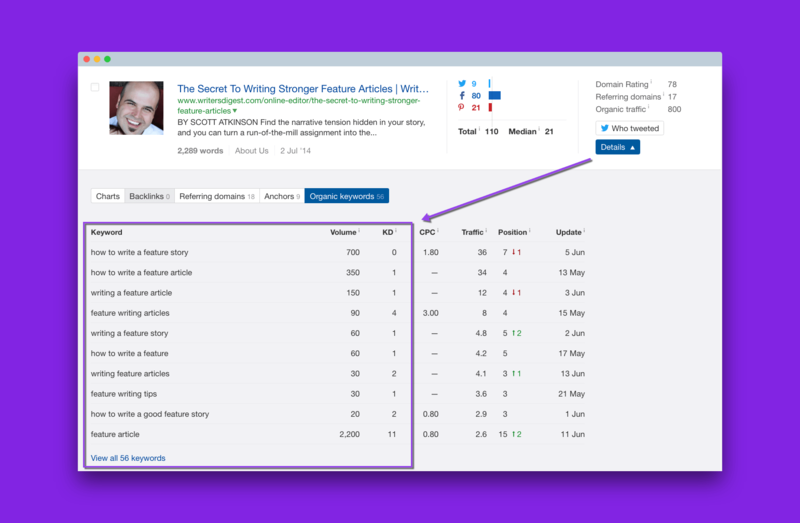 Easy to scale – you can add new silos as you further develop your content marketing and website. Website structure is typically built into most e-commerce website platforms like Shopify. But most business owners just take this built in architecture for granted. Typically the home page generates the most authority and links. As you build or redevelop the website you would then add your best products or collections to your home page. Usually on your navigation and within the body of the home page. So the home page links to the product collection or category sections. Then the collections will link to individual product pages. Within most e-commerce platforms they have a breadcrumb trail which signals the structure to Google. Planning and structuring a website project this way changes the entire dialogue away from design and code into the realities of the client’s business world. With your planning and structure complete, you’ll have a completely different commercial dialogue with clients. When you have done this planning and research and shared it with your client, you will find a completely different dialogue will emerge with them. 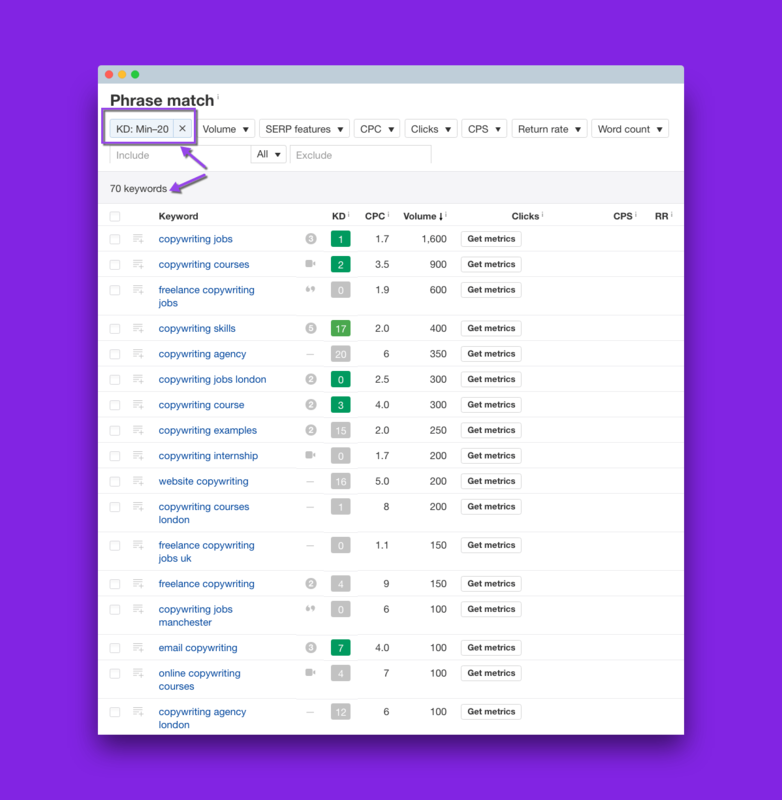 Show the client the list of ideas with the search and click volume and your visual site map. Then a more commercial dialogue will emerge. What content do we create to generate these organic clicks? If you can grab 10% of that monthly traffic, what many visits per month will the website get? When you have traffic estimates can start talking about website conversion rates. What do we need on the enquiry form? Then you can start talking about what percentage of enquiries will be turned into customers? You can share website conversion rates of similar clients. Then you can start talking about what the client typically charges per month. Then you can talking to client about having an email communication plan for those who enquired but did not purchases or use the client’s service. You can map out a communication plan for repeat customer purchases. To sum up, the research, planning and website structure process is both an art and a science. I’ve been involved in websites, search engine optimisation and keyword research for 14 years and in marketing for 25 years. If you are a natural at this type of work, I trust this guide added a little more value to your current process. If you want to remain focused on the front end design or coding then I offer bespoke website planning services for client and web professionals. Remember the 5 P’s; proper planning prevents poor performance. Enter your name and email to receive a copy of this guide and a free template for planning a website structure.